The night is big. Everything heard and seen under the light of the moon looms closer and largerhowling wolves, stretched silhouettes. Even stillness takes on a life of its own. To evoke the expansive, embracing sounds and silence of night, we crafted the most textured big sound in a Breedlove Concert acoustic guitar ever... in the lightest guitar body possible. 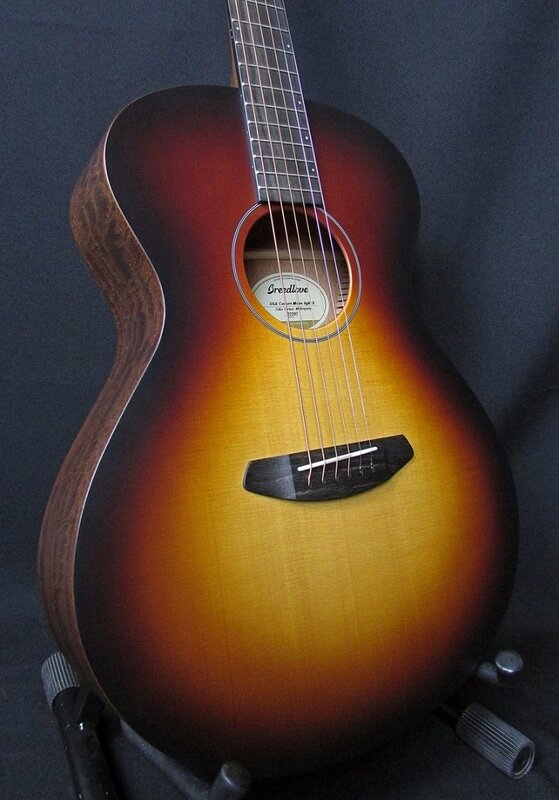 Meet the Breedlove USA Concert Moon Light, handcrafted in Bend, Oregon. Sound frequencies travel most efficiently through lighter materials. With this in mind, Breedlove designers sought a solution for the Moon Light that would reduce weight and bring the acoustic guitar to life in a players hands. Through this search, we achieved the thinnest finish to-date on a Breedlove a mere 5 mils on top and 2 mils for the back and sides. To achieve the results, we conducted extensive Sound Profiling - frequency testing the Sitka tops and mahogany backs. As a result, our tops are thinner, the backs a bit thicker and the sound hole smaller to hit our target fundamental resonance frequency for textured big sound. We wanted the sound of the Moon Light acoustic guitar to speak for itself. So we minimized binding and decoration. Coming in at just 3.5 pounds, the Breedlove USA Concert is almost 25% lighter than the Breedlove Premier Concert Mahogany, which is crafted with the same wood pairings.